If the sight of a jogger jogging in the park jogs your memory, that is thorougly appropriate. 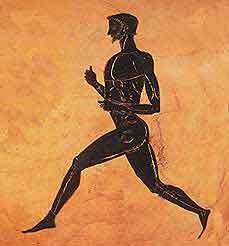 To jog originally meant to jerk. So if your memory receives a jolt, it is jogged, as in the tract of 1778: An Antidote to Popery; or, the Protestant's Memory jogg'd in Season. Jog: to move with small shocks like those of a low trot. So a joggling jogger who jogs your memory, is all one verb jogging around the language. However, it has no relation to juggling - which is actually a cognate of jocular. So every time I see a joggling jogger they'll jog my memory of a juggling jogger from a blogging... er, blogger.